In print’s eternal quest to make up for declining circulation and advertising revenue, the possibilities of premium subscription plans have become a particular source of interest. Hearst’s O, the Oprah Magazine is testing the waters with O’s Circle of Friends, a tiered-subscription model/fan club that takes advantage of one of its singular assets: its readers’ obsession with its founder. O follows titles like Time Inc.’s People, which over the last year has tried its own premium subscription model, dubbed All Access. Like many of its peers in the women’s magazine set, O has suffered declines in both ad revenue and single-copy sales. What has remained constant is its subscriber base, holding steady at 2 million even as newsstand fell 24 percent in the second half of last year, per the Alliance for Audited Media. For all of 2013, ad pages dropped 14 percent, according to the Publishers Information Bureau. 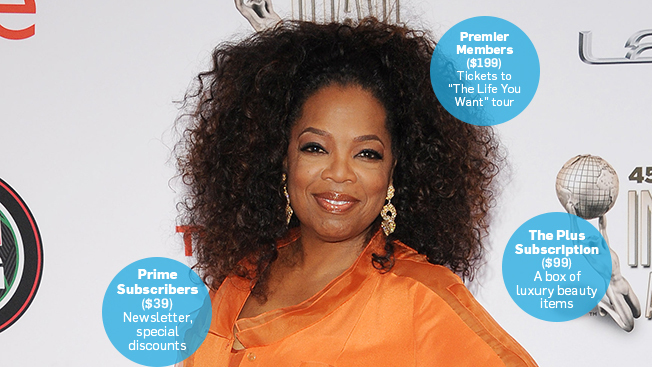 As part of Circle of Friends, Prime subscribers ($39 a year) receive a newsletter featuring a behind-the-scenes look at the magazine and special discounts on Oprah-approved products. The Plus subscription ($99) includes a box of luxury beauty items curated by O’s editors, while top-tier Premier members ($199) get tickets to her “The Life You Want” tour, a chance to test products for the magazine—and even a birthday card from Oprah herself. Kaylin sees it as a far cry from the “mug and tote bag model” or a paywall. (“I feel, generally speaking, that if there is extra, worthwhile content, why not put it in the magazine?” she added.) Rather, the three subscription classifications aim to entice readers by making them feel like they’re getting special access to Oprah.